From the Hancock County Courthouse, go southwest on Hwy 22 for 7.2 miles to the intersection of Hwy 22 and Main Street in Devereux. Turn right on Main Street and go 0.2 mile to Church Street on the left. Turn left and follow Church Street for 0.3 mile until it merges into Jones Chapel / Devereux Rd. Go left on Jones Chapel / Devereux Road and follow it for 2.9 miles to Island Creek Church Road (dirt) on the right. Turn right and go west on Island Creek Church Rd for 0.8 miles. The cemetery is on the right, 180 feet from the road. If coming from Island Creek Church, the cemetery is 3.4 miles east on Island Creek Church Rd. The cemetery will be on your left 180 feet from the road. Currently the cemetery has a cleared area around it which is used by hunters. 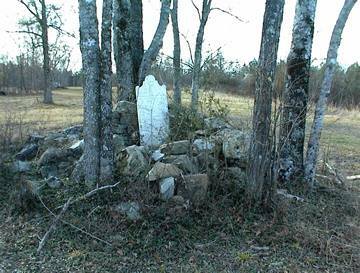 The single grave that exists here is surrounded by a stone wall which has deteriorated, with many stones scattered around the walled grave. A family member recalls that the cemetery was ten or twelve feet long (roughly parallel to the nearby road), and maybe six or eight feet wide. Currently the wall surrounds only the one grave. h/o Mary McDonald, father of Charles J. McDonald. Lived at The Vintage, a home near here. See John Rozier's Houses of Hancock 1785-1865, p. 212. Grave not found in 2002.